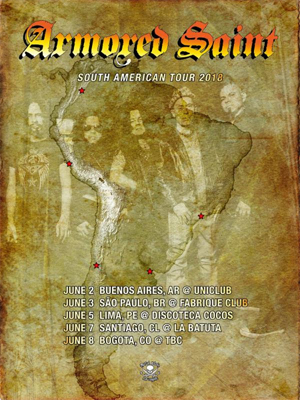 ARMORED SAINT will be heading down to South America for the first time ever! The shows are scheduled for June and include performances in Argentina, Brazil, Peru, Chile, and Colombia. The band is currently at work on a set list full of songs from throughout their entire catalog - it's an event not to miss for South American fans! Vocalist John Bush comments: "Finally!! ARMORED SAINT brings its soulful heavy rock to the passionate continent of South America. I went to South America twice with ANTHRAX and can easily say that those were some of the best shows I did in my life. The rabid fans of places like Brazil, Argentina, Peru and Chile are die hards of music. Their enthusiasm is unprecedented. Also looking forward to going to Colombia for the first time. Can't wait!! The SAINT's Latin roots should be in full force. It's a perfect match." Bassist Joey Vera adds: "After 35 long years we're finally going to tour in South America. The long wait was bitter, but the experience playing for you all will be oh so sweet. See you soon."